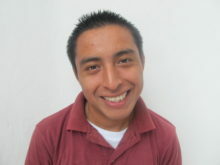 Juan Caal is a young Mayan leader from Toledo who was 19 years old when he became a GOJoven Fellow. Juan has experience with the Toledo Mayan Women’s Council and has worked as a journalist for Plus TV. Juan also demonstrates his dedication to community development through involvement in community clean-up campaigns and participation in door-to-door surveys around health issues such as diabetes. This motivated young leader is excited to connect his training in media with SRH advocacy.